Another gift for Laura... a new family member and instant friend for me! 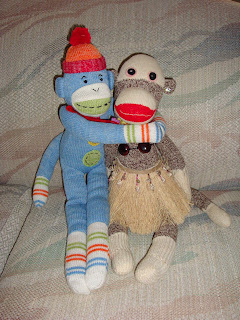 The little monkey in the middle sings "Happy Birthday" when you squeeze his belly. Opening all those presents made me pretty hungry. We went out for a birthday dinner at the Bonefish Grill. 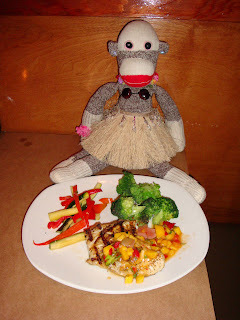 I ordered grilled grouper with steamed veggies to make up for all that cake and ice cream I ate earlier. Now for an explanation of the dual celebration. Today was Mark's last radiation day. I was permitted exclusive access into the room where he received his treatments. 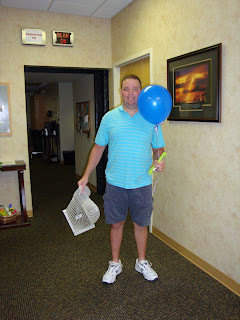 He was given a congratulatory balloon and diploma after 4 weeks of daily treatments. In his right hand he's holding his radiation mask. 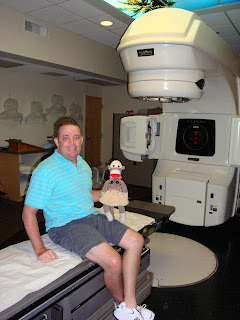 And a big Thumbs Up to Mark for completing his radiation. 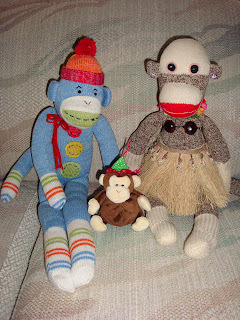 Don't get any ideas about the blue monkey.